In a previous STSM, I travelled to the UK initiate a collaboration with Professor Wells and his lab at the Royal Veterinary College. There we performed experiments in the mdx dystrophic mice model with the main aim to get a proof of principle of the plasmid based microminicircle (miMC) as a functional vector for splice correction. Analysis two weeks after treatment showed expression of the splice correcting U7snRNA but low levels of rescued protein expression. This is in accordance to the Goyenvalle studies using AAV vectors, where only a minute effect was seen after two weeks, but an accumulation of exon skipped dystrophin protein was seen at later time points. The aim of this STSM was to return to the Wells group at the RVC to follow up the investigation of the miMC as a vector for exon-skipping. I analyzed tissue from experiments where the mdx mice had been treated with a miMC expressing an exon skipping snRNA four and nine weeks before harvest. Furthermore, mdx mice had also been treated with a conventional plasmid construct carrying the same exon-skipping snRNA, for comparison with the miMC vector. Cryosectioning and histology analysis of treated muscle showed that treatment with plasmid based vectors for exon-skipping of dystrophin has a positive effect on amount of dystrophin expressing fibres compared to the untreated samples. There was a significant increase in rescued dystrophin fibres at both time points, which is interesting in light of data from the previous COST-enabled visits to the Wells lab. As the Wells cryosectioning method allows collection of tissue for RNA and protein data, I will have the possibilities to further analyze both snRNA expression and pre-mRNA exon-skipping via RT-PCR, as well as protein expression by western blot. In summary, this return visit allowed me to analyze these important follow-up experiments at the Wells lab, a lab has a great expertise in the DMD field. 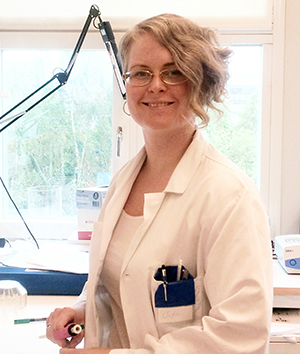 I was able to further familiarize myself with their analysis methods, as well as learn more about the ongoing research in the Wells group and further strengthen the collaboration between the Karolinska Institutet and the Royal Veterinary Colleague. It was a very rewarding inter-laboratory exchange visit.